Have you ever made something that is so good you just can’t get enough of it? That is how I am feeling about this fresh corn and avocado salad. I’ve made it three times in the last five days . . .that is no exaggeration! I really can’t get enough of it. I took it to a party Thursday night and we all went berserk over it. I made it again Sunday night for my husband’s birthday dinner and my mom and mother-in-law couldn’t get enough of it. In between bites they managed to mumble things like, “oh my gosh, this is sooo good”, “I could make a meal out of this”, “I need this recipe”, etc., it was so funny to watch them eat it. They were in total salad heaven. I knew they would love it. I couldn’t wait to share this with you, so I made it again Monday, took some pictures and then I’m pretty sure I ate almost half the bowl . . . .again, not exaggerating! 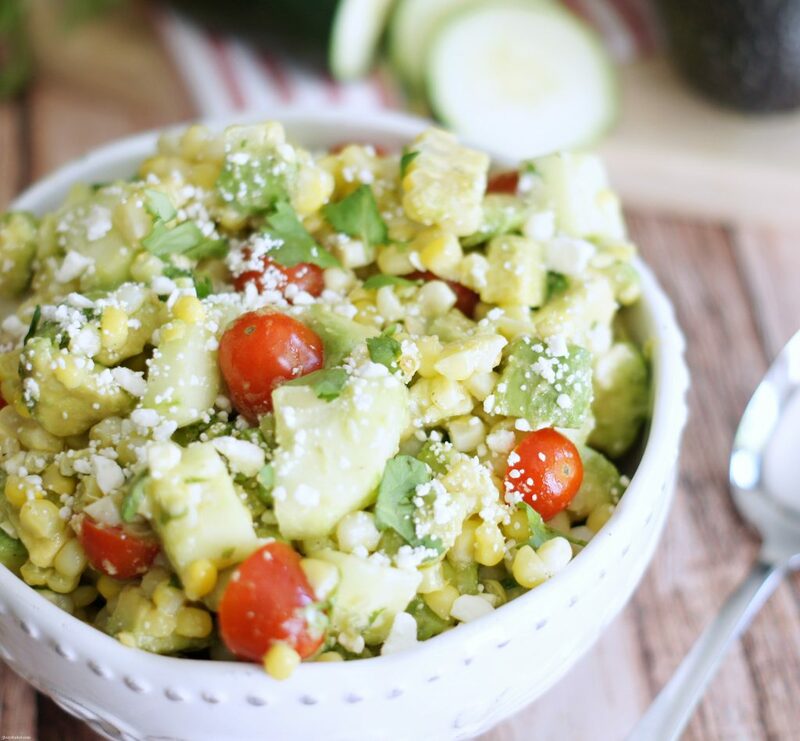 I love everything about this salad, especially the fresh corn and avocado. Funny thing is, I hated avocados until just a few years ago. I don’t know what happened, maybe I just finally got smart. I can’t get enough of them, they are so delicious. All those years I missed out on them . . . what was I thinking? This salad is so easy to throw together and it makes the perfect side for any meal. 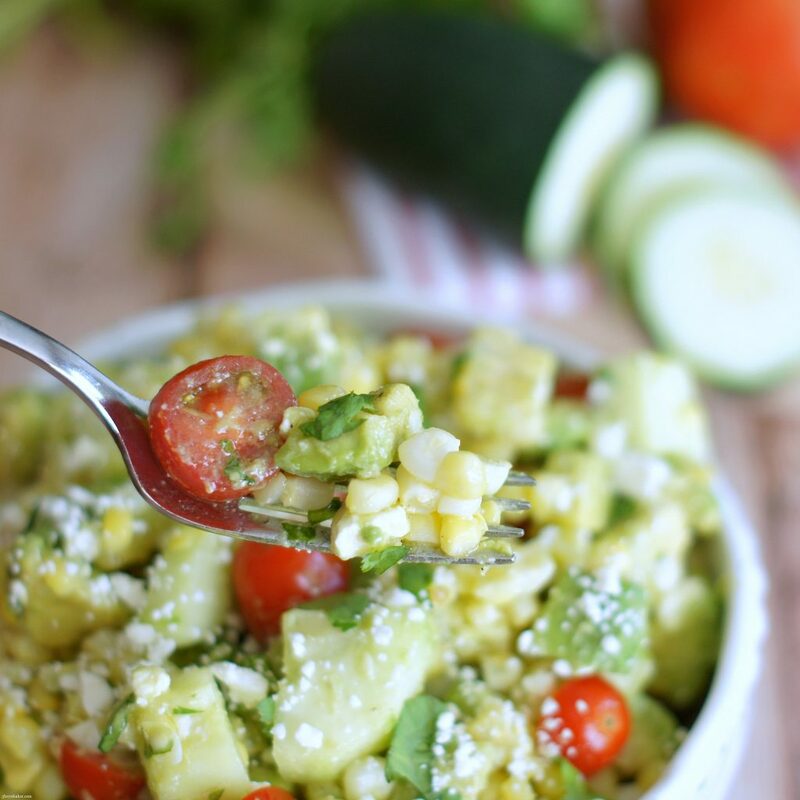 Delicious fresh corn mixed together with avocado, tomato, feta, cilantro and cucumber then tossed in a simple, light dressing. A yummy, refreshing side dish for any meal. Place ears of corn in the boiling water and cook for 4 minutes. Using tongs, remove immediately from water and set aside to cool about 5 minutes. When corn is cool enough to handle, cut kernels off using a sharp knife. 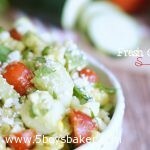 In a large bowl combine corn, cherry tomatoes, avocados, feta cheese, cucumber and cilantro. Refrigerate until ready to serve. In a small glass jar, combine olive oil, red wine vinegar, garlic powder, salt and pepper and shake up. Just before serving, pour over salad and gently toss together. Serve and enjoy! I cannot wait to try this!! It’s sooo yummy Jana. I can’t wait for you to try it! I have made this salad over and over. Whenever I take it anywhere, everyone always wants the recipe! It is so, so good!! !